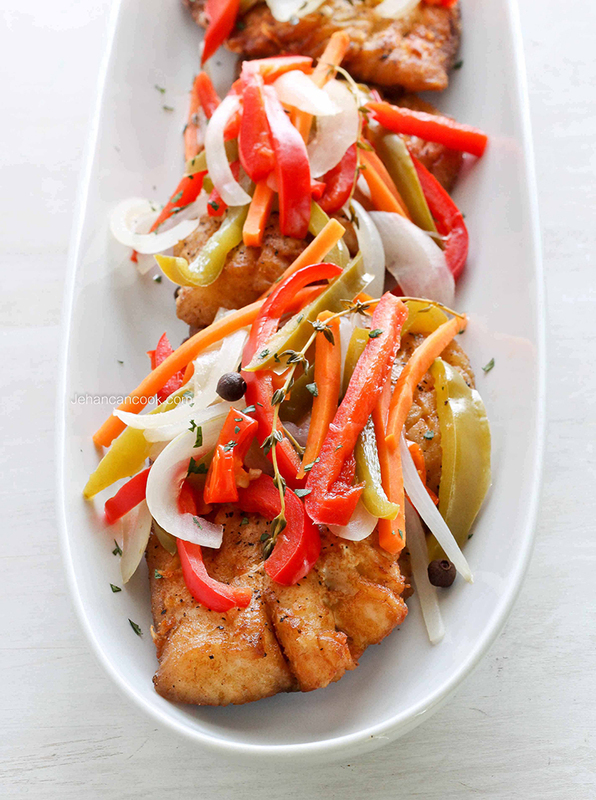 Jamaican Escovitch Fish is a dish where fried fish is topped with a spicy sauce and pickled vegetable medley. Jamaican Escovitch fish is one of my favorite Jamaican dishes by far. 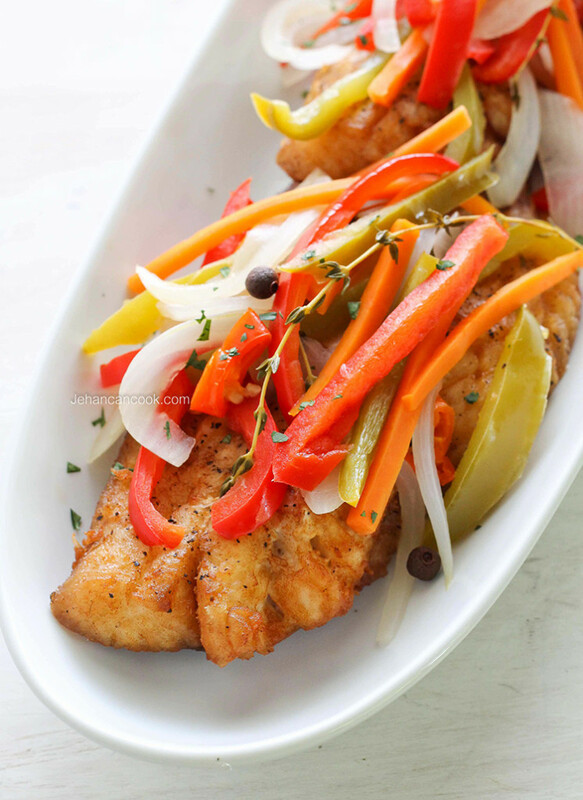 Traditionally whole fish is fried until crispy then covered in lightly pickled vegetables. The vegetables which can be sweet peppers, onion, chayote and carrots are lightly cooked in a vinegar sauce that it’s seasoned with garlic, thyme, Jamaican pimentos and scotch bonnet pepper. This dish is best prepared a day ahead; allow the fish to marinate in the fridge overnight after it’s topped with the pickled vegetables. I used boneless snapper since I have a young son and a husband who doesn’t like fish with bone but you can use whole snapper, king fish fillets or even porgy. I also swapped out scotch bonnet for Trinidadian pimentos to turn the heat down a bit. To prepare fish, rinse well. Squeeze juice of lime over fish then rinse. Season fish with 1 tsp salt, black pepper and all purpose seasoning. Deep fry fish over high heat. Place on a plate lined with paper towel to allow the oil to drain. To prepare the marinade place bell peppers, carrots, onion, clove, Jamaican pimento, white vinegar, thyme, sugar, ½ tsp salt and hot pepper. Bring to a boil, and then allow to simmer for about 3 minutes. Turn off heat and let it sit for 10 minutes. Next place the fish in a dish that you can store in the fridge overnight. 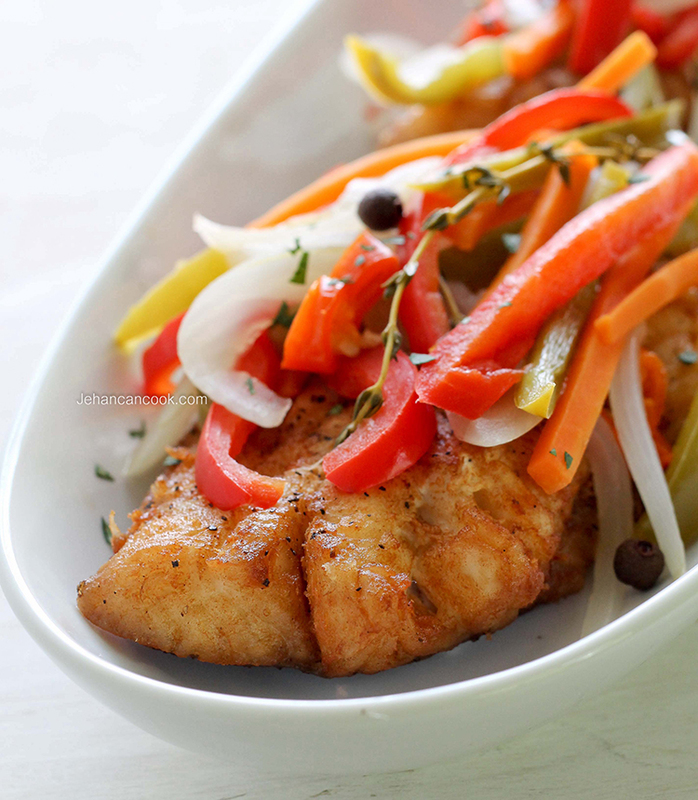 Pour the marinated vegetables over the top of the fish and let sit until completely cool before placing in the fridge. Refrigerate overnight before serving. *I used Trinidadian Pimento Peppers in place of scotch bonnet pepper because Trinidad pimentos has the flavor of a hot pepper without the heat. **Trinidadian pimento peppers is not to be confused with the Jamaican Pimento. Trinidadian pimento pepper is a mild, sweet pepper with a spicy flavor while the Jamaican Pimento is a spice. This looks absolutely sensational. I would love some of this!! Cooking this over the weekend and so glad I found your recipe. Looks scrumptious! Did you put any flour on the fish? Shantay there is no flour on the fish. Tried this on some fresh porgies I caught in New York waters. I didn’t want to experiment on red snapper because it is not a cheap fish. It was delicious! I didn’t know wether or not to use flour. so scored the fish on one side and deep fried them with a light coating of Cajun fish fry. I didn’t boil the vegetables because I found your recipe just after I had started sautéing my onions in butter and olive oil. So I just added the other vegetables to the onions and sautéed everything. I didn’t boil my vegetables. . I didn’t have a fresh sc pepper either, so I substituted the fresh scotch bonnet pepper for Grace scotch bonnet pepper sauce. After I poured the vegetables/ vinegar mix over the fish, I covered them in foil and put them in my pressure cooker oven for 20 mins so the sauce could penetrate and so I could eat them that night. They were delicious! They were even better the next day! Now, I will definitely try this again with red snapper, get fresh scotch bonnet, and deep fry w/o the flour. Great! I’m glad you enjoyed it!